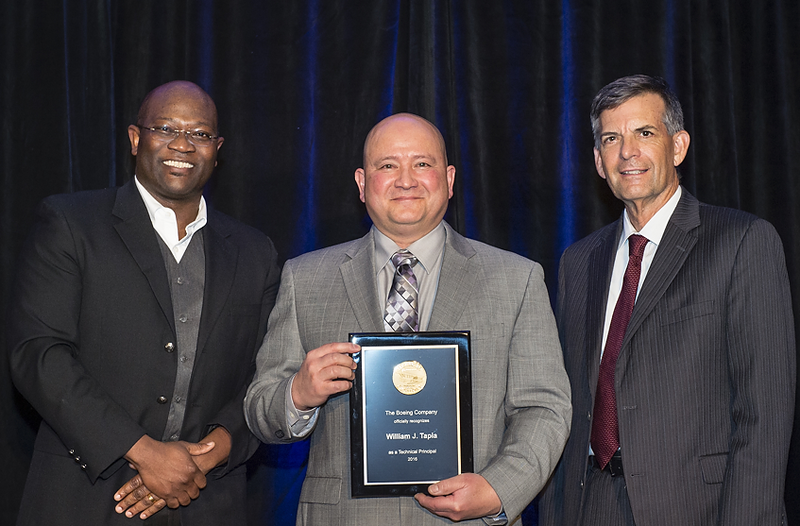 Have You Seen Pics from the 2017 ASNT Annual Conference Awards Banquet? The 2017 ASNT Annual Conference Awards Banquet was a sold out affair celebrating the year's award winners and changing of the Presidential Collar. It was quite an evening to remember. Enjoy looking through some of the photos from the evening. The banquet is always a sell-out. 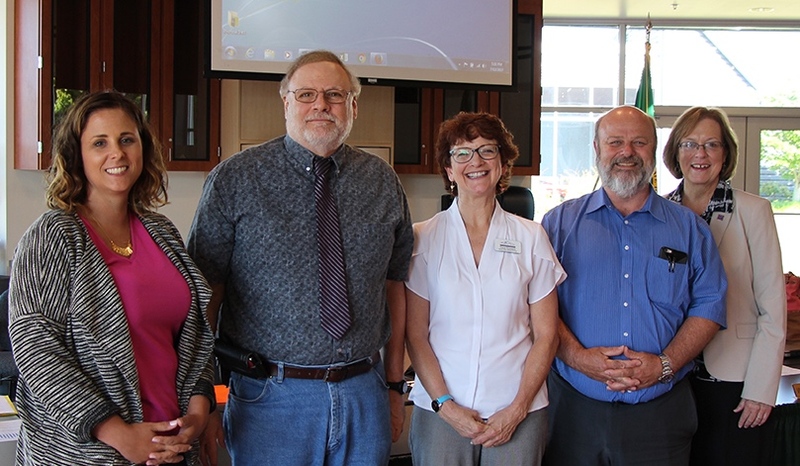 CPTC Nondestructive Testing instructor Charles Musson (second from left) with his tenure committee and CPTC President Dr. Joyce Loveday after receiving tenure. Musson has worked in nondestructive testing since 1976. He began his time in the aerospace industry with stints at National Airmotive Corporation in Oakland, California, and Lockheed Missiles and Space Company in Sunnyvale, California, in the late 1970s and early ‘80s. He spent 10 years at Aerojet Corporation in Folson, California, before moving to Washington to work for Boeing in 1990. Musson remained at Boeing until 2014, at which point he began teaching at CPTC’s South Hill Campus. His job duties throughout his professional career included a broad spectrum of responsibilities from Level I and II inspections in Magnetic Particle Testing, Liquid Penetrant Testing, Eddy Current Testing, Ultrasonic Inspection and Radiographic Inspection. 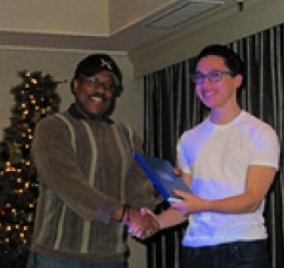 At Boeing, he worked with Level III evaluations in both film radiography and digital radiography. The July 12 announcement concludes a three-year tenure process that includes quarterly teaching observations, regular course evaluations, self-assessments and professional development. Local Pacific NW Section Member, William Tapia (center), is Selected to become a Boeing Techncial Principal for NDT - Congradualtions Bill! Bill also explained the difference between disbonds and delaminations, as well as, when to use focused versus unfocused UT transducers. For example, delaminations are defined as an "interply separation" whereas, a disbond is the separation of the matherial layer adhesive. At the end of his presentation a lively question and answer session ensued making the evening a great learning opportunity for everyone there. To Bill Tapia, the Pacific NW Section of ASNT would like to thank you for your time and teaching us more about the very important method of UT as applied to the ever expnading composites manufacturing industry. 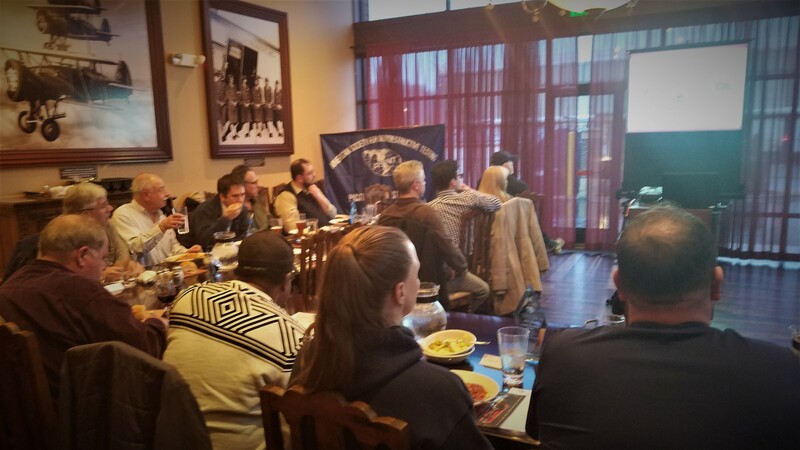 Twenty-five members of the Pacific Northwest section of ASNT gathered at the Old Spaghetti Factory in Tukwila WA to listen to the presentation of “Full Matrix Capture & The Total Focusing Method” by Alan Caulder of Advanced OEM Solutions (AOS). Alan explained that Full Matrix Capture (FMC) describes the hardware process of Phased Array Ultrasoninc Testing (PAUT) data acquisition and Total Focusing Method (TFM) describes the post-processing of the data captured in software. With this methodology, the data can be post processed even years after capture using newer generation TFM software to even further enhance the results. AOS's highly advanced method of TFM represents a marked improvement of the Synthetic Aperture Focusing Technique (SAFT). We learned that indications which may be interpreted as a planar discontinuities such as cracks or inclusions, when processed with AOS's particualr type of FMC/TFM, can be resolved to be separate indications such as string porosity. This allows the trained interpreter to make a more accurate assessment of the data and deliver more relaible results. 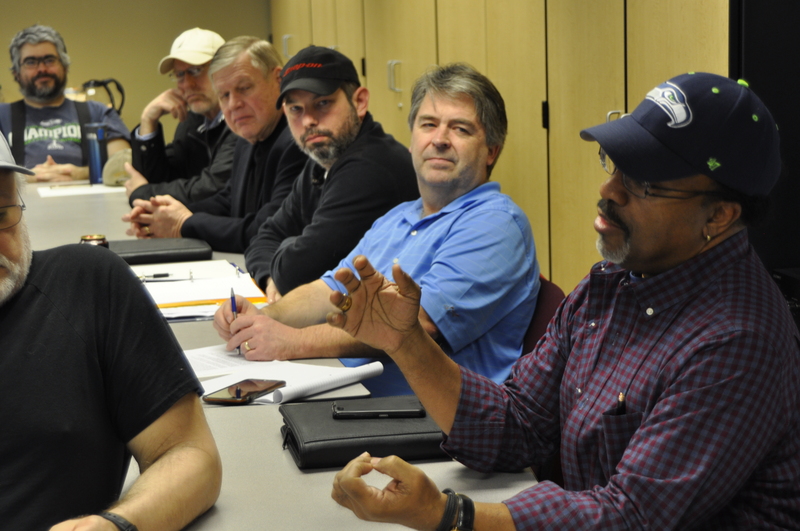 Among the regular members in attendance, there were 6 students from the NDT club at Clover Park Technical College (CPTC) in Lakewood, WA Puyallup campus. As well, two CPTC Instructors joined the group, and at the end there was a very enetergetic question and answer session. On February 13, 2017 the NDT student class and NDI Club of Clover Park School District in Puyallup, Washington along with the Pacific Northwest Section hosted a presentation by guest speaker Marybeth Miceli followed by an open forum panel discussion with attending section board members. 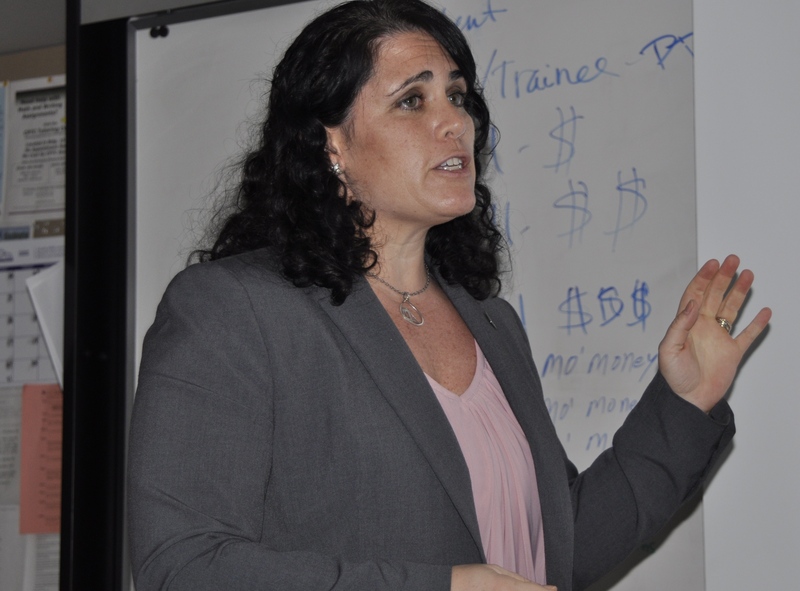 Marybeth gave a presentation to the students on her career in NDT from its inception to current owner of her NDT Consulting and NDT Marketing businesses. 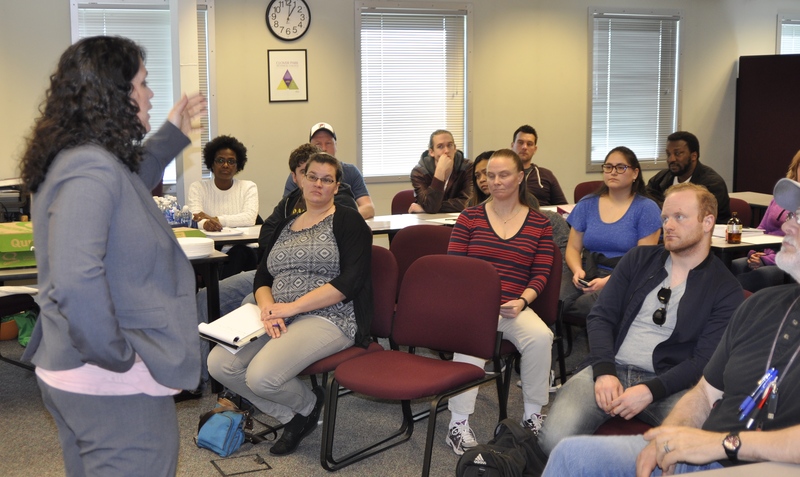 The students listened attentively to her presentation "My Path to Nondestructive Testing (NDT)", which included her beginnings at Virginia Tech and Johns Hopkins to Lucius Pitkin, Inc. The students and Marybeth interacted throughout her presentation with questions and answers about her expereinces when starting out, to her challenges, and what it means to be a female in this mostly male industry. The purpose of the Pacific NW Section in facillitating this forum was to get NDT students exposed to the experiences of accomplished and prolific individuals in the NDT community which serve as a great example for where their careers might go. To that end, Marybeth, along with other board members in a panel discussion, provided "real world" stories to the students while highlighting the diverse opportunities that the NDT industry affords. Also in attendance, to serve on a disucssion panel for the students after Marybeth's presentation, were PNW board members, Pete Torelli, Emery Roberts, Jeff Siegel, Dave Hall, Kathy Ferguson, and Flynn Spears. As we all enjoyed lunch together, generously provided by the college, we had a broad open discussion about what it means to choose NDT as a career, and the many directions such a career might take. The students and the PNW Section members who attended, are extremely greatful to Marybeth for traveling all the way to Seattle and down to the CPTC campus to present her story and interact with a new generation of NDT professionals in the making. We are all very proud of what she has, and continues to, accompish. Twenty-one members plus seven Clover Park Technical College students, who had partcipated in her earlier presentation at their campus, gathered at the Tukwila Old Spaghetti Factory to listen to Marybeth Miceli give her second presentation of the day. At the earlier presentation, Marybeth provided NDT students with her perspective for getting on a path to a successful career in NDT. At the evening session, Marybeth talked about the industry of "Emerging Fatigue, Monitoring & Testing Technologies for Bridges". A startling point brought out during her presentation was that "one bridge fails every 10 days in the U.S.", this according to the Texas Transportation Institute. These fully preventable structural failures have resulted in numerous bridge closures across the country due to partial, or complete, collapse. Marybeth further pointed out that the current practices of NDT, which is mostly just visual without much rigor, has often resulted in repairs to areas of some bridges which are actually not of any structural significance, and therefore do not even require repair. Another alarming fact that she cited, was that there is nearly an 80% false positive rate with the current NDT methods being applied. But we were heartened to learn that there is a solution, which is to apply a continuous monitoing approach using "Electrochemical Fatigue Sensor (EFS)" techncology which was developed by the US Air Force and the University of Pennsylvania. The EFS system amounts to a continous sort of, "EKG" heart monitor approach, only for critical bridge support strucutures. The good news is that currently, the EFS system is in use by 9 State Departments of Transportations in the US, as well as in both Australia and Canada, and there's a strong effort to expand its use across all states. 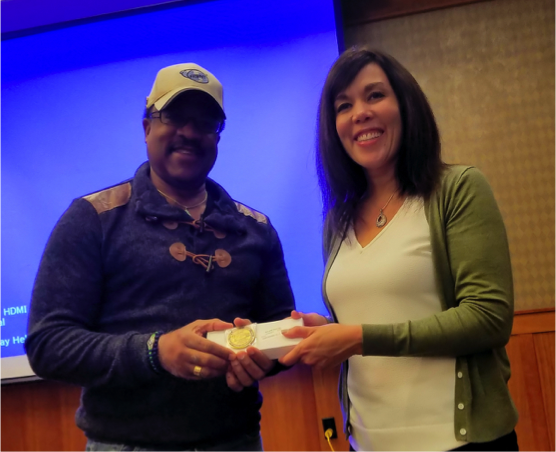 The PNWS offers our profound thanks to Marybeth for taking the time, and expense, to not only come and present to the students at Clover Park, but also to give a very interesting presention, on a highly relevant topic, to our regular section membership as well. Speaker Jay Zimmerman (top), Western Regional Sales Manager for Carestream NDT presenting to Pacific NW Section attendees at the first Technical Meeting of 2017. 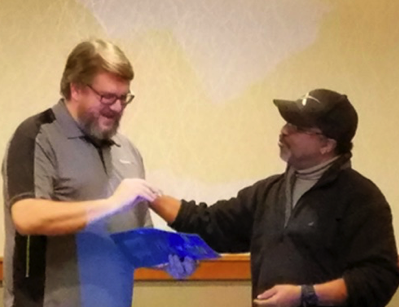 Pacific NW Section Chair, Flynn Spears (right) presents a Certificate of Appreciation, PNWS Challenge Coin, and ASNT Pen & Pencil set to guest speaker Jay Zimmerman (left) of Carestream NDT. 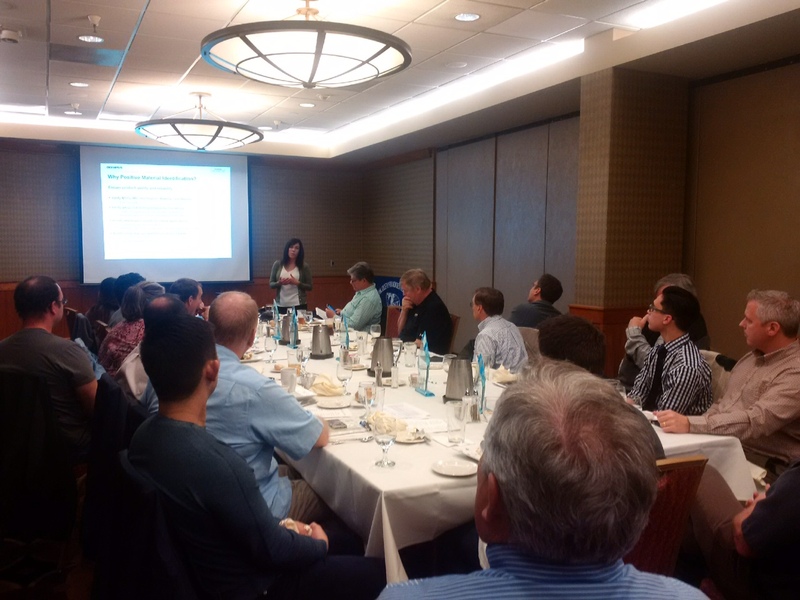 The Pacific Northwest Section of ASNT held its first monthly Technical meeting of 2017 on Monday evening January 9th at the Doubletree Hilton near SeaTac Airport. There were 21 in members and guests in attendance, of which, there were 6 students from Clover Park Technical College NDT Program. The companies represented were, ETM, WJE, Solnex, Delphi Precision Imaging, Mistras, Boeing, Blue Origin, Western Pneumatic Tube, Goodall Infrared, Laser Technology, and Wes Kelson NDT. Our technical speaker was Carestream’s Western Sales Manager, Jay Zimmerman who presented, “Digital Radiography; More than Meets the Eye”. Jay gave an engaging synopsis of the advantages provided by Computed Radiography (CR) as compared to film. We learned that with one shot, CR could provide an image quality equivalent to using 5 different film speeds. Also, that digital capture allows the use of statistical meta data to analyze and enhance image quality at any location in the shot far beyond what the human eye can detect and thereby increasing reliability. To make sure that we all “stayed awake”, Jay made his presentation fun by interjecting 10 pictures of landscapes that he had taken on his travels. When one of them came up he asked the audience to guess in which state the picture was taken and write it down. 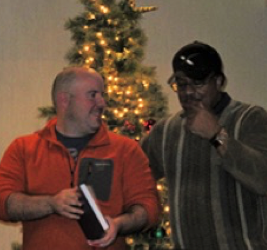 At the end of his presentation, Jay tallied the guesses to see who won bragging rights. It wasn’t easy, and the winner only got 3 states correct. The attendees of this meeting very much appreciated Jay giving of his time to present, leaving us a little more knowledgeable than before about a very important NDT methodology. 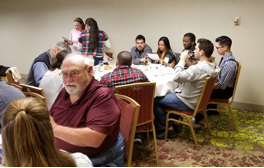 On the evening of December 12, 2016, 27 Pacific NW Section members, students, and guests, attended our monthly social dinner and technical meeting at the Hilton Double Tree Hotel in Southcenter near Seattle/Tacoma international airport. Organized by Kathy Fergusen, to celebrate the holiday season and add a bit of festivity to the evening, each attendee was given a Christmas coffee cup filled with treats to take home. And, as always, good food and great conversation were enjoyed by all. For the evening's technical presentation, Blake Chenenvert of Delphi Precision Imaging, gave an engaging and informative presentation titled "Introduction to Computed Tomography". With this technology, the intricate internal structures inside of test objects of a variety of sizes, shapes, and materials, can be viewed as 3D images. The images are constructed by acquiring radiographic projections from incremental viewing angles taken from multiple positions from 0 to 180 degrees. The individual projections are fed into a computer where powerful algorithms work to reconstruct the test part's internal structures into a whole 3D image which can be rotated in space for viewing at any angle allowing a qualified inspector to detect critical anomalies. Go to www/DelphiPrecisionImaging.com to see some amazing examples and learn more about the technology. The rest of the evening consisted of socializing, networking, and discussions among the members and students in attendance. 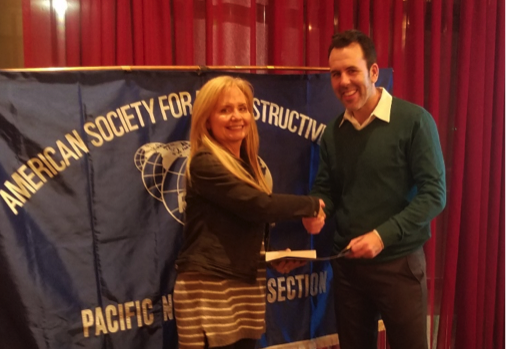 In addition, as a continuation of the 75th aniversary celebration, each attendee was given a ticket upon arrival to the meeting and a drawing was held to give away five copies of the beautifully constructed 75th ASNT aniversary book "From Vision to Mission, ASNT 1941 to 2016". Three students from Clover Park Technical College were among the recipients of this historical compilation which, recounts the rise of ASNT from its roots of the American Industrial Radium and X-Ray Society to the prestigious American Society for Nondestructive Testing that we are today. Click here if interested in procuring your own copy. 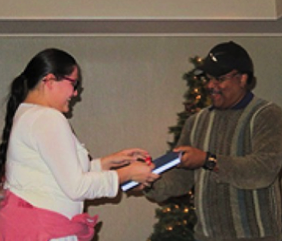 One of the winners of the drawing for the ASNT 75th aniversary book, was a Clover Park Technical College (CPTC) student named, Cheyenne Yazzie. Cheyenne is one of the first high school students to take advantage of CPTC's "Running Start" program. This is a fantastic program where high school students can take college level courses and receive college credits towards a degree while still in high school. As you know this year was our society's 75th Anniversary. We were in the company of veterans of the attack on Pearl Harbor, the founding members of the Tuskegee Airman, and many others who witnessed such history, just to name a few. The 75th celebration, culminating on the Queeen Mary, in Long Beach was well attended by conference registrants, spouses, dignitaries, students, and vendors. The conference kick-off keynote speaker was Astronaut Melvin Leland, who gave a very inspring speech. Dr. Gary Georgeson whose wife was in attendance to see Gary entered into the 2016 Class of Fellows and to receive the highly prestigious Robert C. McMaster Gold Medal award. Mr. Sam Bullard whose wife was in attendance to see Sam receive a much acclaimed award for the Advancement of Active Military and Veterans in NDT. Dr. Steve Brady (who was not able to attend) who received the Young NDT Professional award. 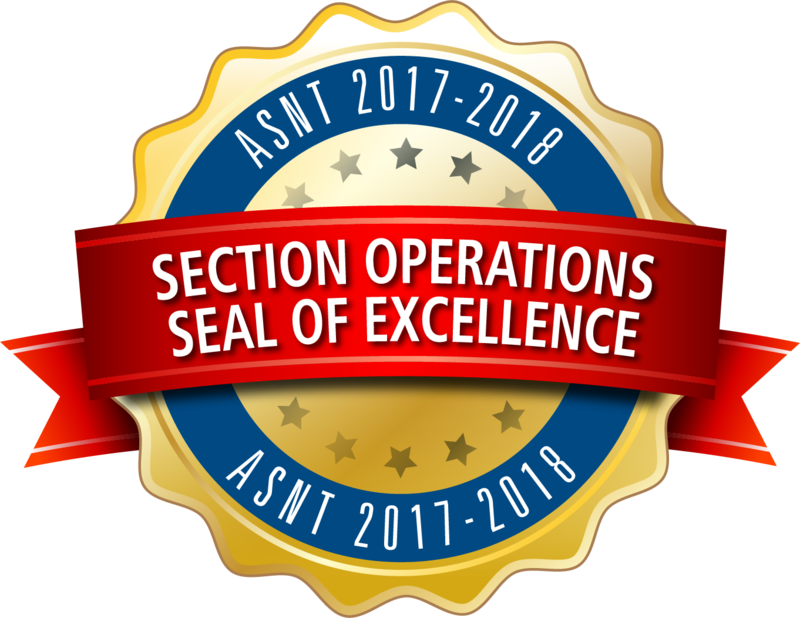 Please join me in congratulating our fellow section members who continue to contribute to our profession by not only increasing the word but also the technical knowledge of ASNT. For the sixth straight year, your section has received the points necessary to attain Gold in the Presidents Points category. The diamond tropphy was received by our past Chairman, Mr. Jeff Siegel, representing the Pacific NW for the 2015-2016 Section year. All-in-all it was a great conference and celebration of our 75 year old society. To continue this legacy of participatrion and involvement in the society that does so much to promote your profession, please come join us for a very informative section meeting (and a little cheer with you fellow NDT'ers) on the 12th, and have a very wonderful holiday season! Seventeen members and guests enjoyed an evening of great food and engaging conversation. Along with our section members were 7 students, and some brought their parents and with spouses. A very interesting presentation of ‘Metallurgy in the 21st Century’ was given by Mr. Dan Wallem of The Boeing Company. Dan's passion for the topic was palpable as he held the undivided attention of all of the members, students, and others in attendenace. Our student directors brought news that an NDT Club had been started at Clover Park Technical College (CPTC). This club, while not a student section yet, will accept memberships from the welding, composite, and all of the NDE programs at CPTC. One of our most distinguished guests was Mr. Samuel Bullard. Mr Bullard was honored at the 75th Anniversary and Fall Conference for the "Advancement of Active Military and Veterans in NDT". 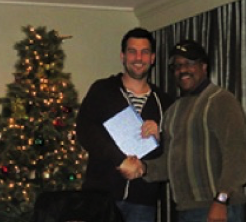 --> 2015-2016 President’s Program Award, Gold Achievement Level: The Pacific Northwest Section (represented by Jeff Siegel, was one of nine sections represented). The October meeting was well attended with around 20 members. We welcomed our two new Student Directors from Clover Park, Diana McRae and Chris Maraschky. A total of six students attended the meeting along with one of their Clover Park instructors, Christine Boswell and her son, Will. Also in attendance was, Jesse Galaviz who is relocating from the San Dieo Section to the Pudget Sound area. Jesse works for HMA and is a Level III in UT. 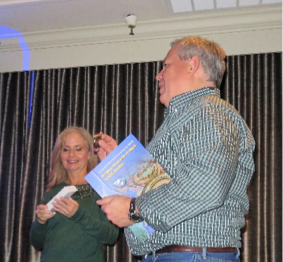 A local first time attendee was Frank Immel of Global Diving and Salvage Inc.
Our Speaker was Dianne Hillhouse from Olympus NDT and she was supported by her local colleage, Ted Roman. Dainne gave a very interesting presentation on Advancements in X-ray Fluorescence (XRF) for Positive Material Identification (PMI) in Manufacturing and Maintenance Applications complete with a live demonstration of an Olympus NDT Materials Analyzer Gun that she brought with her. Applied as an NDT methodology, XRF uses Positive Material Identification (PMI) to quickly identify the specific chemical make up of a particular material under inspection. Dianne gave us a highly educational presentation along with a great demonstration on some sample test pieces. 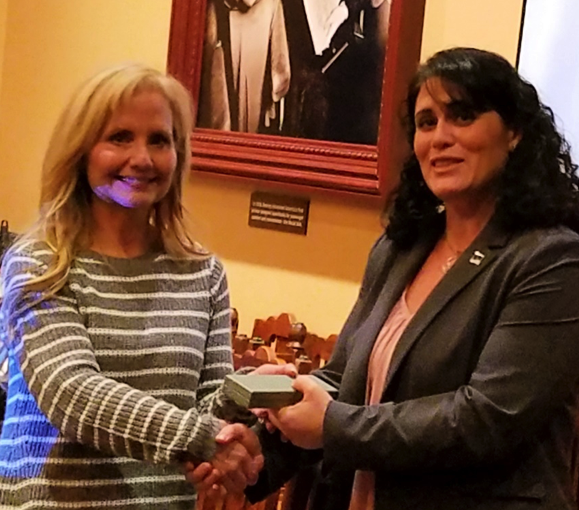 In appreciation of her time and effort, Dianne was presented with an ASNT Pen and Pencil set, our Section Challenge Coin, and her dinner was complimentary. 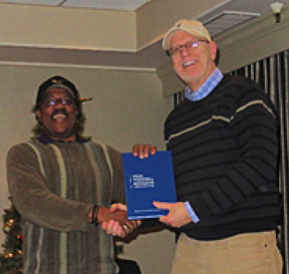 The next meeting will be held on November 14th, again at the DoubleTree, and will feature a presentation of ‘Metallurgy in the 21st Centrury’ by Dan Wallem of The Boeing Company. On Spetember 30th MISTRAS, located in Kent WA., held an open house event in appreciation of its customers. 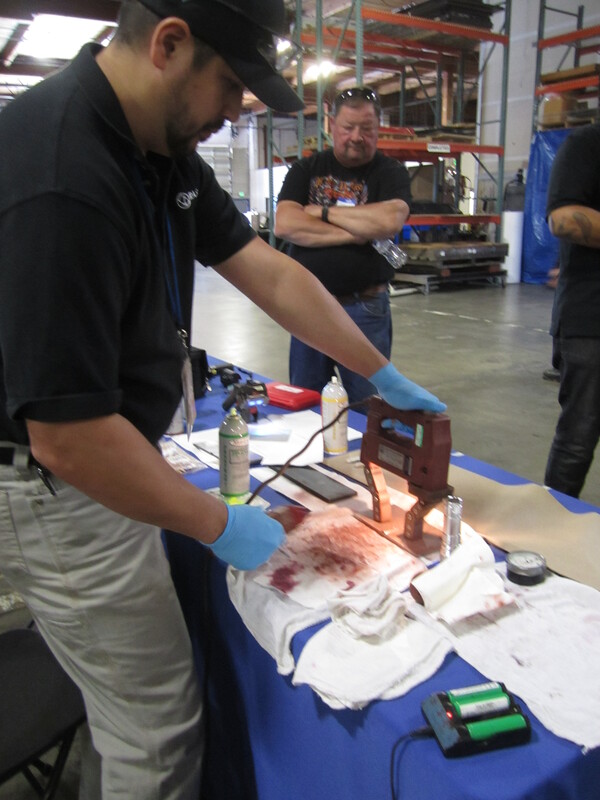 Enjoyed by all were, exciting live NDT demonstrations, food and refreshments, and a Ben & Jerry's Ice Cream truck. There were also raffles for gift cards including Huskies and Sounders tickets! Throughout the day, the Mistras team of NDT experts demonstrated its many non-destructive testing (NDT) solutions, including: Linear Phased Array on Composites; Automated Through Transmission of Composites; Silver Wing Floor Scanner; X-Ray table; Magnetic Particle/Penetrant testing; Rope Access Services; Bond/Eddy Current testing; and Ultrasonic Immersion testing services. Also, on hand were subject matter experts ready to discuss their specialty applications for the Aerospace Materials and inspection industry. As is the case with many other Sections, here in the Pacific NW Section, we have struggled to increase participation. To address this issue, our Chairman, Flynn Spears, suggested that we “change things up a bit” and kick-off our program year with a social networking event. Kathy Ferguson, Vice-Chair, volunteered to organize it. The event was held at Billy Baroo’s restaurant inside Fosters Golf facility just south of Seattle. There wasn’t a cloud in the sky and the banquet room opened up to the beautiful green golf course. The evening started at 5:30p with a mini-putting contest of 7 holes replete with obstacles to make it fun. Jeff Siegel, Past Chairman, awarded Starbuck’s gift cards for 1st, 2nd, and 3rd place, as well as for the most honest (a.k.a. last place). Afterwards, a scrumptious BBQ buffet with all the fixin’s was served. Of the 43 members and guests that joined the festivities, there was a mixture of regulars, first timers, old friends, NDT students, and to our great delight, a few local retirees. The array of companies represented, were Blue Origin, Boeing, Delphi Precision, ETM, Global Diving, Hexcel, Infrared Services, Laser Technologies, Mistras, PM Testing, Solnex, Zetec, Zodiac, and WJE. Emery Roberts, Secretary, made a revolving slide show of our past meetings, golf outings, and various activities, going back to 1957. The slide show brought back many fond memories to our veteran members who lived it, and inspired a lot of great conversations with our newer members and students. The event feedback was a resounding thumbs up! Thanks to Kathy Ferguson for going above-and-beyond, and to the members of the BOD who helped her make this event a success. Hopefully now, we will see more new faces at our regular meetings and events throughout the coming season! The Pacific Northwest Section has been awarded the Gold Tier Level President's award for the 6th straight year! Thanks to all of the regular meeting and event participant members for taking the time and making the effort to achieve this proud acomplishment. 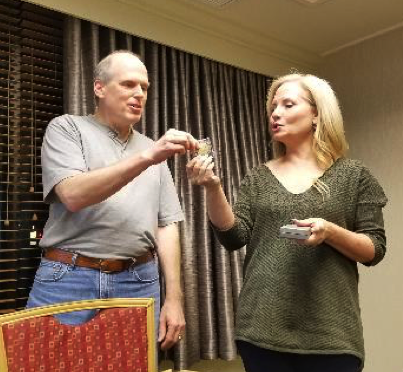 In order to improve communication with the PNWS membership, this year's BOD took on an intitiative, driven by the incoming chair Flynn Spears, to add more dynamic capabilities to the Section website. The old site, generously developed and maintained by Emery Roberts, has served the section well for over 20 years now but the Section has simply out grown it. The new site will have things like, the ability to RSVP for meetings and special events, and a PayPal button which can be used to securely pay with your credit card for activites like the Golf Tourny and other such membership events. 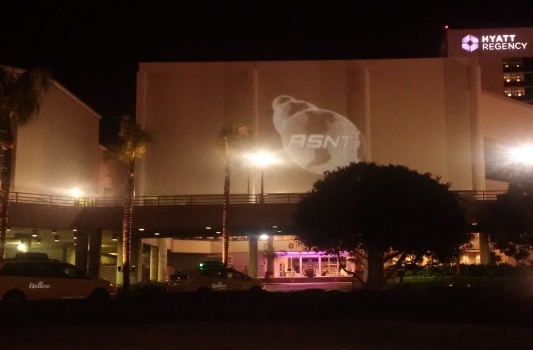 ASNT is celebrating 75 years since the formation of the American Industrial Radium and X-Ray Society in 1941. Growth in membership, and the expansion of the mission, caused a name change, in 1946, to the Industrial Radiography and Non-Destructive Testing society. In 1967 the name was change again, this time to the American Society for Nondestructive Testing (ASNT) which it is know by today. ASNT has matured to become the world leader in NDT certification with more than 15,000 members in 95 sections located in the U.S.A. and in a wide range of countries such as Germany, Turkey, Nigeria, South Africa, Korea, Saudi Arabia, China, Mexico, and Canada, to name a few. This year's Fall Conference, in Long Beach CA Oct. 24 - 27, will be going all out to celebrate this milestone year. hope to see many of you there! 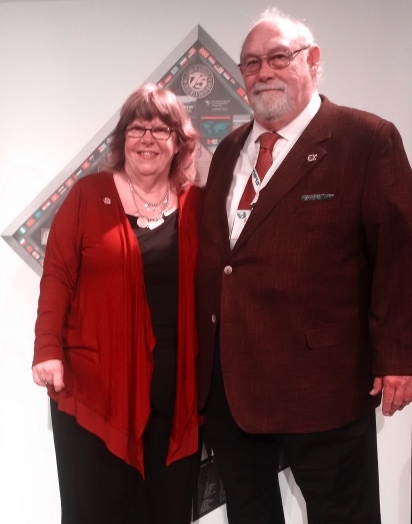 “On behalf of the Pacific NW Section” …is a statement those of us who are present at the ASNT National Awards Dinner state when accepting the Presidents Points award. For those who can attend, or have attended, experience a great feeling of pride at these moments as your section representatives. These awards whether as a section or individual are a great testament to the dedication we all have towards our profession. As your Chairman for this year I will stand to accept this industry recognized award which spotlights our PNW section as one of the key sections totally and fully involved in increasing the value of ASNT to its members, local industry, and training institutions. If you plan on attending the conference, and you're a PNWS member look for our other members and come share in this experience.